The newly appointed Rwanda Defence Force (RDF) service chiefs have officially assumed office today. A press statement from RDF said that handover ceremony took place at RDF headquarters in Kimihurura this morning, witnessed by RDF top leadership including the Chief of Defence Staff (CDS), Gen Patrick Nyamvumba and the Air Force Chief of Staff (AFCOS), Maj Gen Charles Karamba. The changes were made by President Paul Kagame and Commander-In-Chief of Rwanda Defence Force (RDF) yesterday. 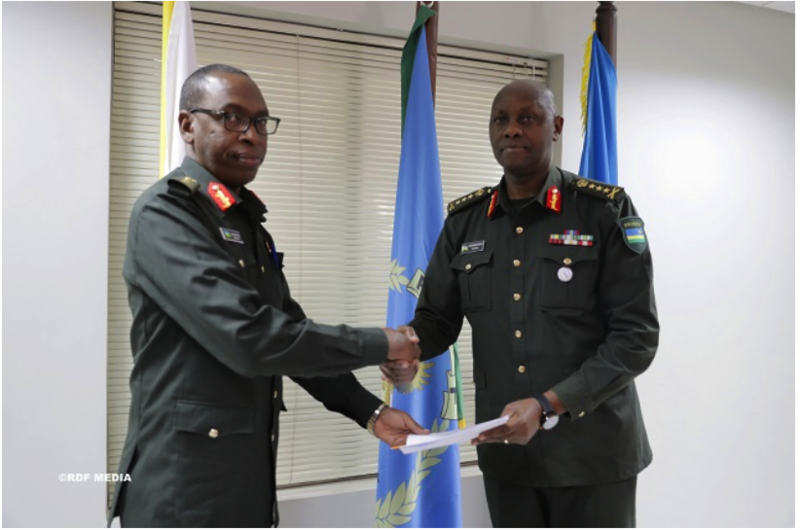 Lt Gen Jean-Jacques Mupenzi was handed over office by the outgoing Army Chief of Staff (ACOS) Lt Sen Jacques Musemakweli who in turn took office as Reserve Force Chief of Staff (RFCOS) from Maj Gen Aloys Muganga who was appointed as Commander of the Mechanised Division in the same reshuffle. The CDS invited the new office holders to work harder and with a team spirit in order to better contribute to the achievement of RDF’s mandate.